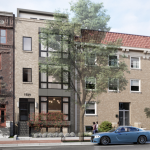 Fred Schnider’s five unit condominium building at 1729 T Street in the Dupont Circle neighborhood of Washington, DC has been unanimously approved by the Washington DC Board of Zoning Adjustment. Developed in a venture between Travis Fleisher, R Street Development and Fred Schnider, the building will be constructed by Harbor Builders, designed by acclaimed Washington, DC architects, Teass Warren and marketed by Smith | Schnider. The project provides a unique opportunity to build a ground up condominiums in this neighborhood amongst many historic buildings that are preserved and on the National Registry of Historic Buildings. Interestingly, the section of T Street where the building is located was originally developed by Henry A. Willard, and a street behind the properties bears his name. Willard is perhaps best known for the exquisite Willard Hotel built at 1401 Pennsylvania Avenue near the White House and later restored by Oliver Carr, Jr. and A. James Clark. 1729 T Street will contain two studio units on the walk out lower level, a large unit on the entire main level and two large, three story units with roof decks above. The building on the end of the street will bookend 1729 T Street.